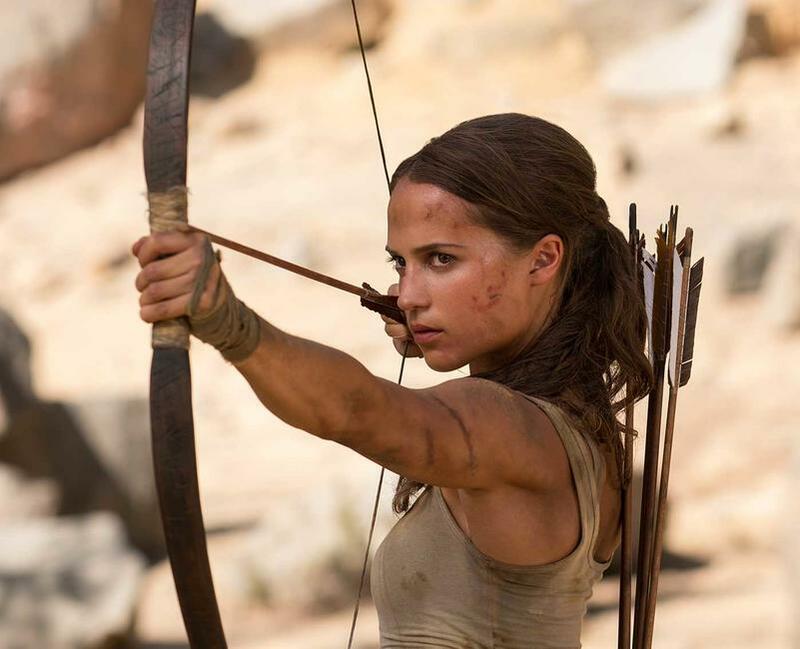 When they re-launched, rebooted and rebranded Lara Croft as a younger, inexperienced and grittier character, they also opened the door for a more cinematic Tomb Raider. This meant that just watching the trailer for the video-game was enough to make you realise that this new character could actually work as a movie with some depth to her rather than the Indiana Jones rip-off that Angelina Jolie gave us. This approach continued well with Alicia Vikander being cast as the titular character. She is worlds away from Jolie’s version of Lara Croft but resembles (in spirit if nothing else) the newer version that is now gracing consoles. With this new look came a decent enough back-story. There is an absent father again but also a resentment for her wealth, a care-free dare-devil attitude and an inquisitive nature which gets her stuck into the movie’s main story. The title is also quite misleading in this respect. The actual raiding of tombs doesn’t occur until deep in the movie’s third act. This is an origin movie for Lara Croft and a gritty one at that. This version of Croft is not a superhero. She has bravery, an ability to shoot a bow and arrow and that is about it. This means that when she comes up against the movie’s villain, played by the fantastic Walton Goggins, she is out of her depth, scared and shocked, particularly when the deaths start to occur. Those deaths are also as brutal as the new approach to the character. There is beatings, point-bank executions and a more mature approach to telling the video-game characters story. This also translates to the action sequences too. There are some very thrilling set-pieces, including wrecked planes, waterfalls, booby-traps and shipwrecks that all involve some bone-crunching action and wince inducing injury that shows that there are consequences to the tomb raiding. As with all great archaeology movies, there must be a McGuffin to chase. This particular McGuffin actually holds some interest and there is a good balance between realism and the supernatural. Just as it feels the movie is getting silly or delving into territory that could betray the more serious and mature approach it is adopting, the plot pulls it back and adds science to the mysticism. This goes for the actual tomb raiding as well. This part of the movie offers it’s own thrills and excitement but unfortunately nothing that hasn’t been seen before and better (notably in Indiana Jones and The Last Crusade). This means we get booby-traps, cryptic clues and nonsensical technology for primitive eras. It forces a suspension of disbelief that isn’t too far a leap but does jar slightly with what has already been established. As a reboot of this iconic video-game character, Tomb Raider works extremely well. It is a different person to the Jolie super-archaeologist and means that we get a Lara Croft which fits nicely into the more gritty and modern 21st century approach to our heroes. A sequel wouldn’t be a bad thing. Overall, Tomb Raider successfully adapts the rebooted version of Lara Croft and does what that video-game series accomplished by creating a grittier, brutal and more mature version of the iconic character. The plot works well, the casting is brilliant and the origin does enough to potentially launch a sleeper-hit of a movie franchise.